Part memoir, part spiritual guide, and part metaphysical manual, DREAMS AND THE WISDOM WITHIN weaves a compelling narrative of the power of dreams to guide our health. Journalist Joyce Lynn shows us of the power of dreams as a spiritual practice outside the confines of religion or psychotherapy. She revives dreams as a mandatory modality in our daily lives. DREAMS AND THE WISDOM WITHIN draws on scientific research, metaphysical information, and real life stories to illuminate the transformative power of our nightly messages. Drawing on her experience as a reporter and first-hand knowledge with dreams, Lynn offers a three-step healing blueprint and envisions a future of medical care with dream guidance at its center. The stories of women who have accessed dreams to prevent, diagnosis, and treat illness are told in DREAMS AND THE WISDOM WITHIN. In one remarkable story, the deceased mother of a Kentucky woman appeared in dreams and warned her, “There is cancer growing in your right breast.” The admonitions persisted despite three “clean” mammograms. Finally, an ultrasound verified the dire dream warnings. After surgery and chemotherapy, Ellie was cancer free. Sixteen years later, Ellie, now 79, extolled her life-saving medical care. “It is important people listen to their dreams,” she said. The extensive reach of dreams is told through Lynn’s personal experiences. Dreams helped the author salvage her self-esteem and grasp her true worth as a woman; recover from a potentially serious illness, halting a stampede toward cervical cancer; find a healthy eating plan; discover life’s intended career path; handle the business and content of reporting; end a dysfunctional romantic relationship; reconnect with her religious roots and discover an inner spiritual center. DREAMS AND THE WISDOM WITHIN empowers women and minorities — the major sufferers of the major illnesses of our time and those disenfranchised by traditional medicine. Lynn, a former political reporter, now writes about women’s health and spirituality. 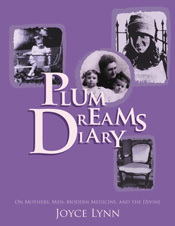 She is the author of PLUM DREAMS DIARY: On Mothers, Men, Modern Medicine, and the Divine, a collection of dreams exploring the contemporary female psyche. She has reported on how our thoughts affect our health, the benefits of Mediterranean and vegetarian diets, and public health care policy. She has profiled peace activist Cindy Sheehan and artist-activist Claudia Chapline and others whose dreams have influenced their art, activism, health, and business ventures. Her articles have appeared in dozens of publications including Ms. Magazine, the Pacific Sun, Online Journal, and Louisville Magazine. This entry was posted on Sunday, July 27th, 2014 at 1:24 pm	and is filed under HEALING. You can follow any responses to this entry through the RSS 2.0 feed. Both comments and pings are currently closed.